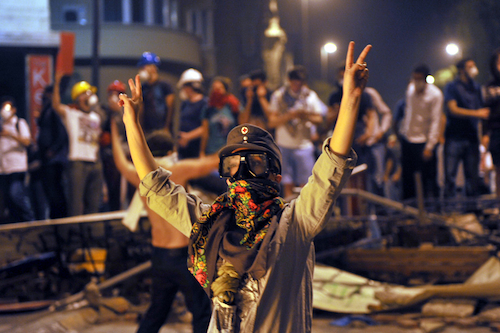 What future for the Turkish uprising? 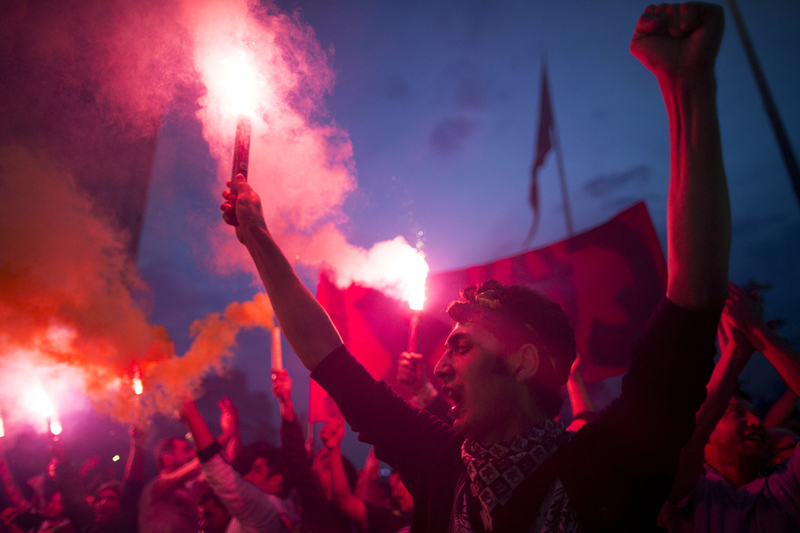 Provided the uprising is not crushed or hijacked — and does not fizzle out — it has the potential to create long-lasting changes in Turkish democracy. 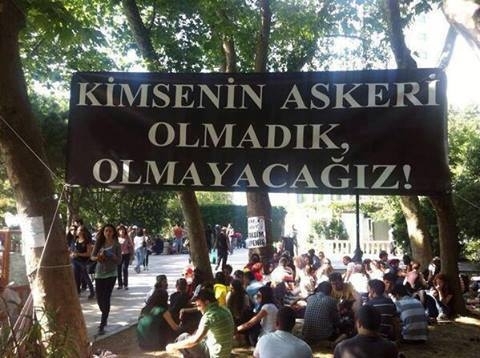 The actions taken by a coalition of activists against the destruction of a public park in central Istanbul have spread to more than 60 cities and provinces, bringing several million people onto the streets in widespread protest against the ruling AKP government. The government has periodically jammed communications, shut off surveillance cameras, and used its influence over the national media to suppress knowledge of both the scale of the uprising and the brutality of the police response. As of June 8, 2013, the police have withdrawn from Taksim Square, leaving it at least temporarily in the hands of protesters. The protesters have erected networks of makeshift barricades at 50 meter intervals along all major routes leading to the square. 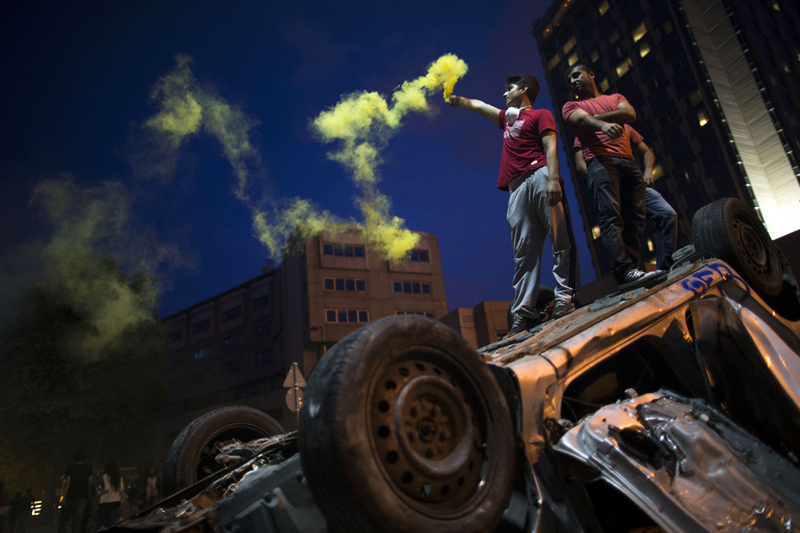 Major clashes have occurred in other areas around Istanbul and in many cities across Turkey. There have been three confirmed deaths, thousands injured, mass arrests, and unconfirmed reports of widespread police torture. This article does not aim to give a structural account of the causes of the uprising, an undertaking that, like an obituary for a celebrity, could be scripted before an uprising even begins. Such accounts do more to explain away the events taking place within Turkey rather than engaging seriously with them. They speak more to the Turkey of yesterday than the Turkey of tomorrow. Instead, this article attempts to outline the possible paths the uprising may take. 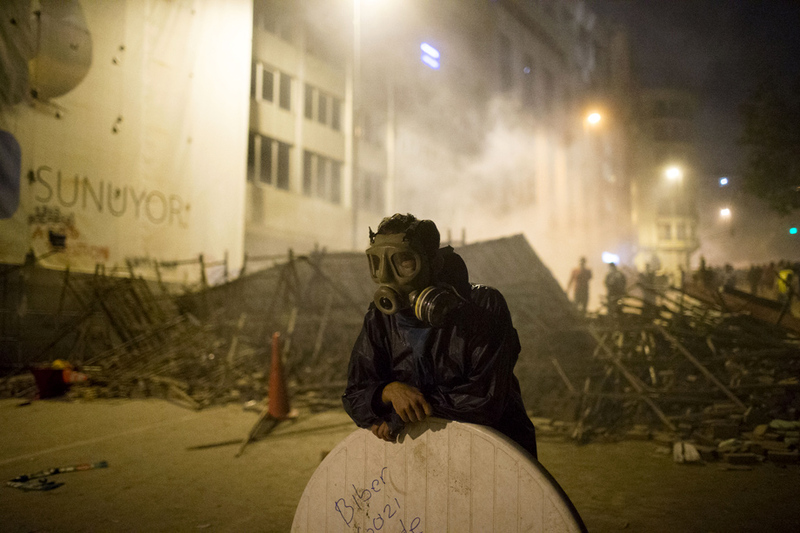 Beginning with the pre-dawn raid of Gezi Park on May 30, the state response made aggressive use of riot police, assaulting crowds with copious amount of gas, water, and rubber bullets. Although blanketing many urban areas of Turkey in a near continuous cloud of gas, choking bystanders and protesters alike, the state apparatus has — for the moment at least — avoided the excesses of the Arab Spring. Although there have been a number of confirmed instances where AKP thugs backed by police have attacked peaceful protesters, Erdoğan has yet to make good on his repeated threats to bring out his army of supporters. On June 4, the Istanbul Police issued an order to refrain from the use of gas save for instances of self-defence, though unprovoked police aggression continues throughout Turkey. The protesters, for their part, have shown remarkable restraint. How long this situation will last is an open question. As the uprising has spread, it is beginning to have a perceptible impact on the functioning of Turkish capitalism itself. Major commerce centers throughout Turkey have turned into quasi-warzones, the stock market dropped over 10 percent on its first day of trading following the start of the uprising, and the protests are starting to affect Turkey’slucrative gas deals with its neighbors. On Tuesday, Deputy Prime Minster Bülent Arınç warned that the protest had already cost the economy 70 million Turkish lira (28 million Euros). If these disturbances continue, or are intensified by large-scale strikes, the situation may change dramatically. While the government seems to have pulled back somewhat from its initial onslaught, perhaps hoping to ride out the storm, capitalism is much less patient and has many more friends. If Turkish and international capital feel that the uprising poses a threat to their interests, Erdoğan will face increasing pressure to resolve the crisis. Such a scenario would have two solutions: increased support for Erdoğan and a consequent escalation of state violence, or international pressure for Erdoğan to diffuse the situation (through concessions or resignation) and a consequent de-escalation of state violence. At the moment the latter is looking more likely. The Greek and Spanish revolts that erupted in the summer of 2011 were marked by a total renunciation of the existing political order. The protests were aimed not only at the ruling government but against the political system in its totality. All of the existing political parties, in fact the entire system of representative parliamentary democracy, came under indictment. Revolting against the “democratic” society that denied their existence, the Greek and Spanish occupations created, through their vast networks of general assemblies, structures of a direct democracy they believed should take its place. The current situation in Turkey is different. The AKP has been in sole possession of government power since 2003. As a result, the various opposition parties, led by the Republican People’s Party (RPP) and the National Action Party (NAP), have not been implicated in the current crisis. The uprising has singled out the AKP and only the AKP as the root of its problems. Much like the Muslim Brotherhood in Egypt, the opposition parties have been caught totally off guard by the scale of the uprising and have scrambled to interject themselves into the situation. For their part, the protesters have shown a remarkable eagerness to move beyond the old political, ethnic, and religious allegiances. However, despite the present non-partisan tenor of the uprising, it would be unwise to discount the possible future impact of the opposition parties. As the days have passed, Turkish flags and nationalist chants of “we are the soldiers of Atatürk” have made their mark in the streets. Perhaps more worrisome have been the belated but effective attempts of opposition leaders and MPs to capitalize on the events, throwing their weight behind the uprising in speeches praising the courage of Turkey’s youth. If this trend accelerates there is the possibility that the uprising could devolve into a forced referendum (successful or not) on the AKP government, leaving the underlying political system unchanged. Such an outcome could presumably have waited for the next election cycle and avoided the gas clouds, mass arrests, and bloodshed. A persistent concern of many involved in the uprising has been the possibility of its self-exhaustion. These fears have so far remained unjustified. The first week of the protests have been marked by both an increase in absolute numbers of protesters and a widening of the social and political backgrounds of those involved. As the weekend battles gave way to the working week, the central squares of Turkey have become permanently occupied by different sections of society depending on the time of day. More radical activist groups maintain a night watch over the squares and are joined by striking unions and students during the work day. The largest crowds occur during the evening hours as middle and lower class workers bring their families to picnic, protest, and share the news of the day. There is a perceptible though by no means certain shift of the uprising from the initial violent clashes to a more festival-like atmosphere. What this heralds for the future is an open question. Though a minority, there are groups — especially on the more radical left — who are itching to take a more violent path and see in these developments an enervation of the struggle. How long the government will allow barricades and the unpoliced occupation of central squares is also not clear. On Friday, the Istanbul Police issued a statement that they would refrain from further police action until Monday, leaving the city in the hands of the protesters throughout the weekend at least. Continued stalemate could in turn lead to a dissipation of the uprisings energy, something the AKP government may be banking on. Though, if the size of the protests of this weekend are a guide, this strategy does not seem to be working. Provided the uprising is not quashed by murderous repression, hijacked by a nationalist discourse that serves only to empower the opposition, and does not fizzle out through exhaustion, it has the potential to create long-lasting changes in the practice of citizenship and representation in Turkish democracy. This path involves the wholesale or partial reconfiguration of political participation in Turkey. It involves the creation of new democratic forms and practices and stands (in the absence of massive worker rebellion) as the most revolutionary outcome of the uprising. It is also, without question, the most precarious and fragile of its possible solutions and one open to immediate undoing. The most profound yet overlooked aspect of the uprisings that shook the Mediterranean world in 2011 was the countless practices and institutions that spontaneously emerged within its central squares. In Cairo, as the state apparatus withdrew (though not before committing 800+ murders), upwards of a million people, left to their own devices, had to figure out how they would live together in a square in order to sustain a revolt aimed outside of it. Within this space, the Egyptian people organized and orchestrated their own security, dealt with human and regular waste, and created services for the elderly and the poor. The Egyptian revolutionaries established supply networks for food and information, set up a kindergarten, handled hired agitators, and protected each other’s religious practices. The same spontaneous creation of new institutions and practices was even more evident in Greece and Spain, where nightly assembly meetings empowered and funded subcommittees dealing with food, protection, medicine, outreach, horticulture, information, tattoos, and the media, managing all aspects of social and political organization within the squares themselves. Life in these squares stood as a powerful testament to what ordinary people can build in the absence of state power. 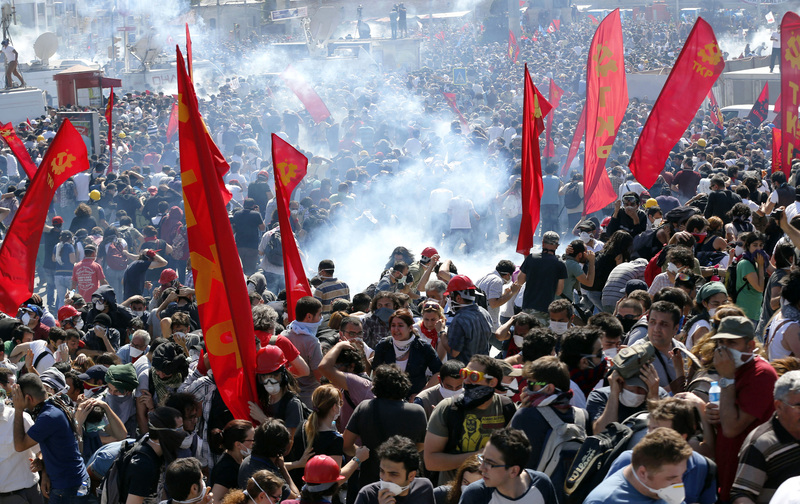 Similar practices and forms are developing in the Turkish uprising. The networks of medical and legal support, the supply lines servicing protesters with free food, supplies, internet access, and safehouses, even the collective building of barricades and the organization of night-watches to protect liberated zones from police assault, are proof of this spirit. Perhaps more important is how these acts of solidarity have gone viral within Turkish social media networks, shared as joint reminders of the latent generosity of the Anatolian people. It is still early going, but the spatial conditions for more permanent structures and initiatives have begun to materialize. For the past few days Taksim Square has become a ‘liberated zone’, a fragile oasis surrounded by massive and ever growing barricades. As of June 5, a people’s library, dozens of free food, blanket, and medical supply stations, LBGT and gender awareness tents, and areas for musical performances and political speech have been set up in the square. For the religious holiday of Kandil, protesters have set up alternate spaces for prayer and dance and invited all those in the square to find a stranger with differing political beliefs to sit and chat with. These spontaneous structures and initiatives mushrooming amidst the now ubiquitous graffiti and political banners offer a stark contrast to the scripted choreography and corporate sponsorship of festivals previously organized by the municipal-capitalist alliance. More than an assertion of the right to the city, the self-organization of life in the square attests to the power of ordinary people to actively structure the social space itself. Such police-free zones are also taking root elsewhere in Turkey. Barricaded against police harassment, freed from the constant threat of dispersal, these encampments are creating new practices, allegiances, and institutional forms organically within the uprising. 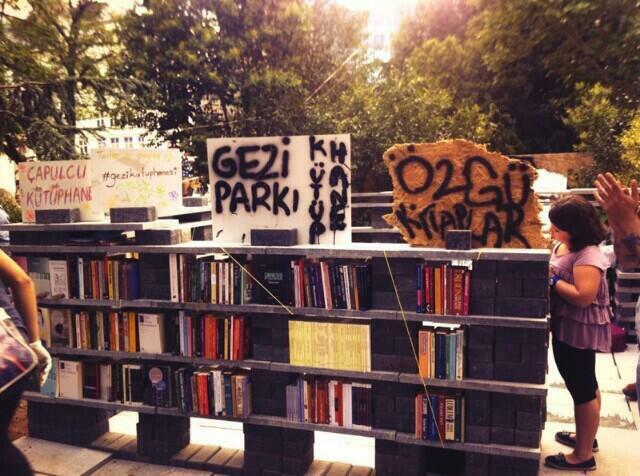 Only time will tell if these spaces can be sustained and what the Turkish people will make of them. One thing, however, is clear: the reconfiguration of the Turkish political field, if it is to happen, will happen here. Another factor that has ironically pushed the uprising down this path has been the relative impotence of established experts and commentators. Here the total media blackout during the initial days of the uprising by domestic outlets has actually been a blessing in disguise. That documentaries on Antarctic penguins aired while violent clashes were being waged in every major city in Turkey drew people away from their televisions and into the streets. It has also forced people to discuss and debate among themselves the meaning and direction of the uprising rather than defer opinion to the tried and tired talking heads of the Turkish media. As the mainstream television channels slowly begin to report on the ongoing events, this is something to keep in mind. The Turkish president Abdullah Gül recently remarked that “democracy does not mean elections alone.” A statement of the obvious and the only one from the AKP leadership to acknowledge the truth of situation. To this statement we would add one thing. For the moment, the uprising has located this democracy in the collective participation and poetry of the Turkish people. It has so far refused to entrust the uprising to any sort of leadership — whether old, new, or military. Keeping the uprising this way will be no easy task in a country which has grown accustomed to strong leaders since its inception. Mehmet Döşemeci is an assistant professor of History at Bucknell University working on the entangled histories of Modern Europe and the Turkish Republic. His book, Debating Turkish Modernity: Civilization, Nationalism, and the EEC, will be published in Fall 2013 through Cambridge University Press. He is just beginning a new research project exploring the histories of radical publics within Europe and the Middle-East, providing historical context for the popular uprisings that have mushroomed across the Mediterranean basin since 2011. Yetkin Nural assisted in the research of this article.